What else is there when life has no point? 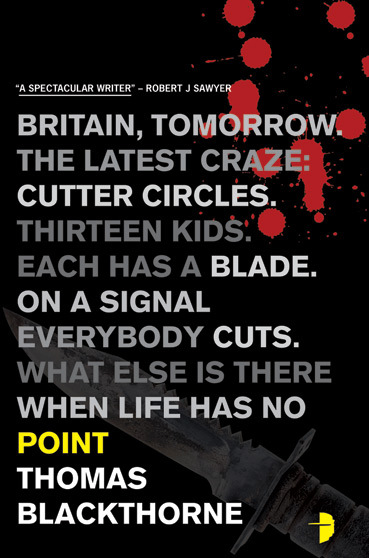 In a Britain on the edge of collapse, the lost teens have formed Cutter Circles, a terrible cult based on mutual suicide. For ex-Special Forces soldier Josh Cumberland, this is just the start of another descent into the very heart of darkness. Savage satire and incredible near-future thrills from the author of "Edge". I must confess that I have never heard of Thomas Blackthorne before so I didn’t quite know what to expect. It turns out that Thomas Blackthorne is actually a pseudonym for acclaimed science fiction writer John Meaney. I’ve been meaning to try some of his work so this would be as good a place to start as any. I had a few minutes to kill while taking a break from a project and started in on the first few pages. Before I knew it my quick break had turned into ten minutes of intense reading and by the end of the first chapter I was completely hooked. Point is set in Britain sometime in the near future. It’s a bleak future indeed. America has degenerated into a rogue state after their fanatical president used nuclear weapons on his own country. The world is in the grip of winter due to the nuclear induced dust cloud and televised knife fighting has become the nation’s idea of entertainment. The novel revolves around two main characters, Josh Cumberland and Dr Suzanne Duchesne. Josh is an ex-member of an elite Special Forces team, The Ghost Force, which specializes in cyberwarfare and Suzanne is a neuropshych therapist – basically a therapist who makes Jedi mind tricks look tame. Josh is contracted to find a missing scientist, while Suzanne is recruited by MI5 to investigate the Cutting circle blight that has caused the deaths of hundreds of teenagers. It soon becomes apparent that there is a connection between the two cases and they have to put a stop to the people responsible, while fighting for their lives. Point is the sequel to Blackthorne’s previous novel Edge. 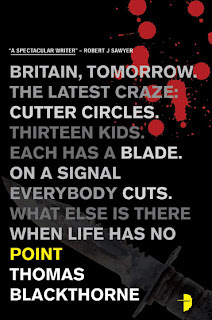 Since I haven’t read Edge I was pleased to see that Point does very well as a standalone novel. At times you do get the vague impression that you are missing out on some of the history between the characters, but it doesn’t detract much from the novel at all. I’m definitely going to be checking out Edge to see how things started. I was thoroughly impressed. Point is an action packed thriller set in a plausible future world and has it all – lots of fast-paced action, gadgets that would make James Bond green with envy and a main character who can give Jason Bourne a serious run for his money. Best of all there are ample Star Wars references in the banter between characters – a nice touch for us geeky readers! The plot keeps you guessing and tearing through the pages at a ferocious pace to find out what happens next. The action sequences are well thought out and sometimes breathtaking in their brutality. Josh Cumberland doesn’t take prisoners. The twist at the end really elevated the novel to another level. The best way to describe Point is as Tom Clancy’s Net force on steroids with a dash of Jonathan Kellerman’s psychological intrigue thrown in for good measure. All of which gets combined into a package that makes for a bloody good read! It seems I’ve gone a bit crazy when it comes to buying books. When the people in the Post Office start to give you funny looks since you pick up packages in bulk, you know you have a problem. I have a HUGE problem. I can’t seem to resist adding to my book collection at every opportunity. It’s not that I’m running out of things to read. My “To-read list” will most likely keep me busy for the next two years or so. It’s purely due to my inability to say no to a good deal on a book. I blame The Book Depository – it’s only after I discovered them that things got out of hand. Damn you and your great prices, speedy service and 10% off temptations. 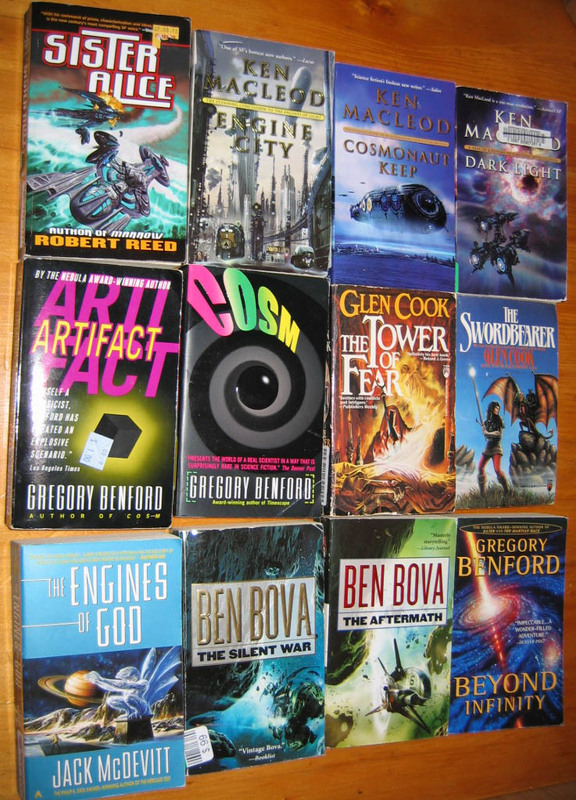 With that confession out of the way, feast your eyes on my precious new arrivals – truly a tower of magnificent fiction. And they are mine, all mine! I've had to revert to horizontal stacking for my fantasy bookcase. Guess it's time to get another bookcase. I'm thinking I'll have to go for something custom made. Perhaps a floor to ceiling model would be appropriate. Any suggestions? 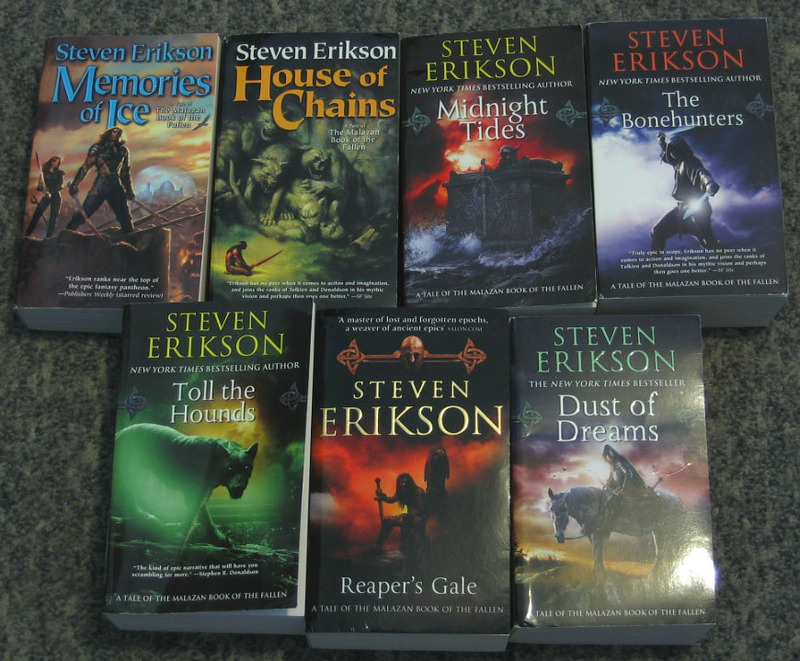 First up is the rest of the books in the Malazan series by Steven Erikson. I haven’t read any of the Malazan books, and since the last book is coming out at the end of the month it seemed the opportune moment to add them to my collection. I hope they are as good as everyone seems to think they are. These are book 3 to 9 in the series: Memories of Ice, House of Chains, Midnight Tides, The Bonehunters, Toll The Hounds and Dust of Dreams. I've got book 10, The Crippled God, on pre-order and it should ship soon. When I'm going to start reading the series is a different question entirely! I also got The Warded Man by Peter V. Brett and the replacement of my Legends of Drizzt: Book II also arrived. The original was shipped on the 5th of January, but never made it here so The Book Depository shipped a replacement. Strangely enough the book they originally shipped ALSO arrived at the same time. What are the chances of that? The package had lots of yellow tape around it stating that the Post Office found it damaged and sealed it. The actual book inside has bent corners and some damage to the bottom and top corners of the spine. Another case it seems where the Mail Lite bags used in shipping isn’t adequate. The replacement book which was shipped in a cardboard package is in much better condition and actually made it here within the correct time frame. I’d still like to know where the original disappeared to for more than a month, but I guess that’s going to have to remain one of life’s mysteries. 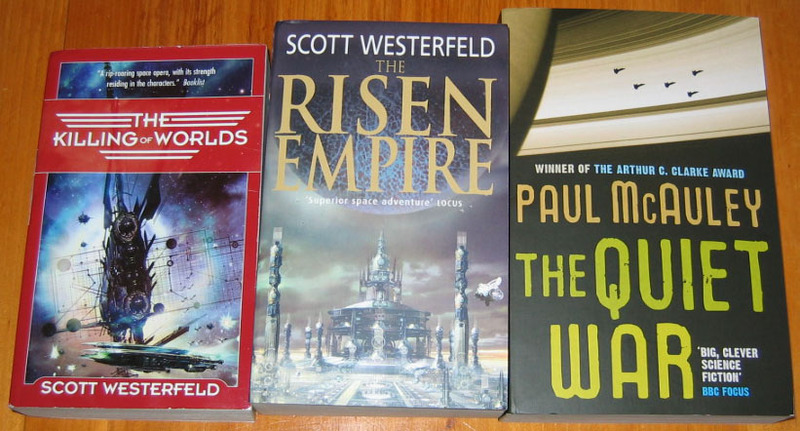 I didn’t neglect my science fiction collection either. 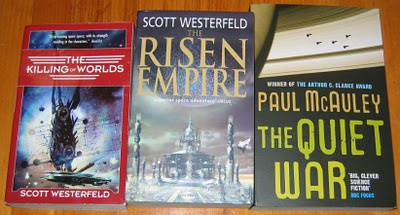 I’m exploring some new authors and got The Risen Empire and The Killing of Worlds by Scott Westerfield as well as The Quiet War by Paul McAuley. The Quiet War’s cover has a nice tactile feel to it, but I have to question the cover artwork somewhat. On closer inspection it seems to have a squadron of normal fighter planes (?!) silhouetted over Saturn’s rings. Not a promising sight. I hope that it only amounts to a lazy cover artist and that it’s not an indication of the quality of the actual writing. The Rock Rats, the second novel in the Asteroid Wars series, continues where The Precipice left off and deals with the events of the first asteroid war. The asteroid belt is now the new Wild West with people rushing to stake their claim on resource rich asteroids. It’s a futuristic gold rush where the stakes are high and the payoffs immense, provided that they can stay alive long enough to reap the benefits. Martin Humpries, the head of Humpries Space Systems (HSS), wants the asteroid belt to himself and he doesn’t mind killing innocents to get his way. He hires ruthless mercenaries to act as pirates in an effort to drive his competitors as well as independent prospectors out of business and out of the belt. Lars Fuchs is the only man willing to stand up to Humpries and HSS. After being driven to breaking point he becomes a renegade and decides to fight fire with fire and resorts to piracy as well. He acts as a lone champion for his fellow Rock Rats, swooping in to protect them from the HSS mercenaries and giving Humpries a taste of his own medicine. I quite enjoyed the novel, but it wasn’t as good as The Precipice. I think it mainly boils down to the fact that I loved the initial ideas shown in The Precipice. The Rock Rats is more action packed and features the first space battles in the series. The battles are very realistic. 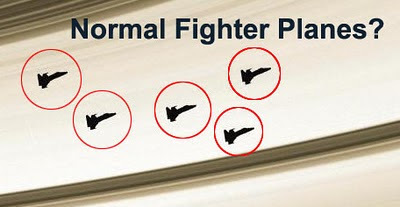 No fancy maneuvers or fantastical weapons. They rely largely on luck and getting the first shot in before your opponent gets the chance to do the same to you. The characters could be better developed and once again the focus on Amanda’s beauty was slightly irritating, but much less so than in the first novel. Humphries remains a thoroughly despicable antagonist and you find yourself rooting for the little guy, Lars Fuchs, with abandon. Unfortunately there’s no happy ending, but I guess that goes with the territory for a second novel in a series. If you like science fiction that focuses more on the possible reality of human space exploration then this novel, and the rest of the series should be on the top of your reading list! Once, Dan Randolph was one of the richest men on Earth. Now the planet is spiraling into environmental disaster, with floods and earthquakes destroying the lives of millions. Randolph knows the energy and natural resources of space can save Earth's economy, but the price may be the lost of the only thing he has left - the company he founded, Astro Manufacturing. 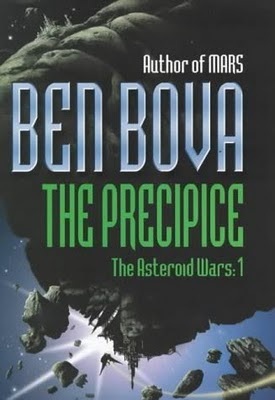 I picked up The Precipice and The Rock Rats at a book sale a couple of years ago. 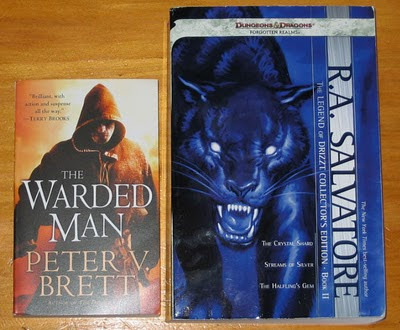 I shelved them and promptly forgot about them, that is until I recently managed to buy the last two books in the series. I’m sorry I waited so long. If The Precipice is any indication of what to expect from the rest of the series I’m in for a treat. The Asteroid Wars series fits into the much longer Grand Tour series using the same setting and some recurring characters from that series. I haven’t read any of the Grant Tour novels so I was pleasantly surprised to discover that it doesn’t really diminish the story by much. At times you feel you lack some of the history and background story, but those moments are few and far between. The novel stands on its own very well. This is very much a hard science fiction novel and focuses more on ideas than straight-out action. It’s set in the very near future with humanity struggling to cope on an Earth devastated by global warming. The Earth needs resources badly and their only hope is in exploiting the abundant resources locked up in the asteroid belt. The invention of a new type of spacecraft engine, a fusion engine, promises to make asteroid mining a feasible prospect. The story revolves around two main characters, both the heads of large corporations. Dan Randolph wants to use the fusion engine to help humanity while Martin Humphries is only interested in enriching himself regardless of the cost to humanity or anyone else. Humphries wants to manipulate Randolph into risking it all so that he can get control of Randolph's company, Astro Manufacturing. The rivalry between them sets the stage for what promises to be a very interesting series. The technology and science used in the novel is very realistic and a very probable extrapolation of what will be in use within the foreseeable future. In fact most of the technology (cryogenics, rejuvenation treatments, nanomachines) is actually in development right now. 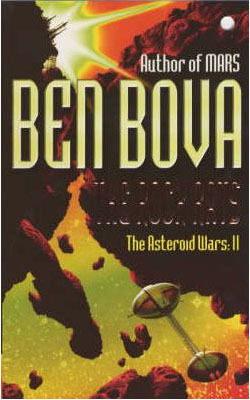 Ben Bova tackles tough questions and issues that will become increasingly important in our future. How will religion handle cryogenics when it finally becomes possible to revive people after they have been frozen? Will nanotechnology be allowed when it poses so much risk and so much advancement? Who gets to control space resources? Can someone own an asteroid, moon or a planet? I found all the ideas intriguing and that is what made the novel so appealing to me. It makes you think about the implications of a future world that might be all too probable. The only problem I had with the novel is that it has a slightly sexist slant at times. There are two very strong female characters, Pancho and Amanda. At almost every opportunity Amanda’s beauty is described in detail or emphasized in some remark. It really felt overdone. I think what Bova wanted to show was that physical beauty can be just as much a curse as a blessing. In actual fact Amanda is a very smart character that plays a pivotal role in the expedition to the asteroid belt. If you are intrigued by the idea of space exploration and not afraid of a more cerebral read, then this is the novel for you. It might lack flashy space battles, but the concepts explored and the realistic science makes for an immersive read. Highly recommended. I can’t wait to get started on the next one! Lately it seems that I've been buying more books than ever before, increasing my backlog of books waiting to be read into the next couple of years. Still, that doesn't seem to prevent me from amassing even more! First up is some books from The Book Depository. 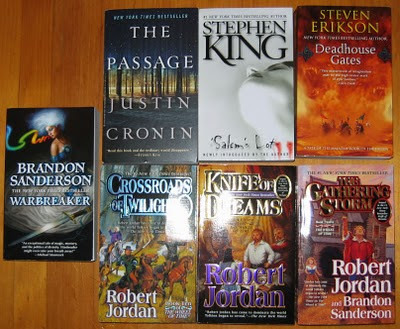 I'm gearing up for a complete re-read of the Wheel of Time Series. Now I only need books thirteen and fourteen and I'm all set to go. 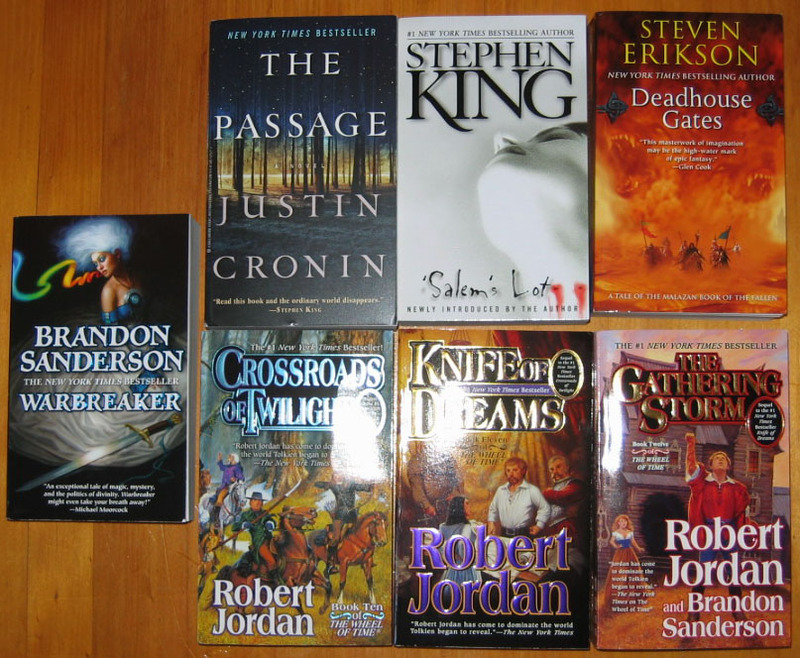 The second batch are some secondhand books I ordered from Better World Books. I'm reasonably happy with the condition of most of these books, but I still prefer to see the condition of the actual secondhand book before buying. Their shipping time is also quite a bit longer, clocking in at about a month and a half before the package gets to South Africa. Now I seriously need to get a bigger bookcase!